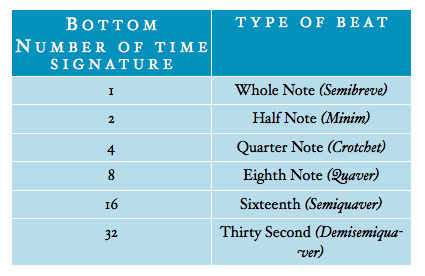 A time signature appears at the start of every piece of sheet music and consists of two numbers on top of each other (a bit like a fraction in math, but without the line). I’m going to look at why we need a time signature and give you a quick practical activity to try. I’ll also explain the two things that a time signature tells us about the beat and the one thing you must do when looking at a piece of music. Why do we need Time Signatures? 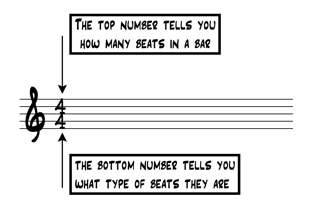 When counting the beat of a piece of music we could start at the number “1” and keep going to whatever number we got to by the end of the piece. This would mean that we wouldn’t need a time signature. However, there would be a few problems with this approach…. We would soon lose count! Similar to the way we don’t like to go beyond “G” in the alphabet, we musicians don’t really like to count beyond “4”. Sometimes we’ll go to 6 and, if we’re really pushed, we may even count as high as 12!! But, we tend to like 3 or 4!! Starting at “1” and ending at “1,000” or so would make it very difficult to give the music a “groove”. The groove (or the “feel”) of a piece of music stems largely from how the beats are grouped together. The feel of a Viennese Waltz and a march differ for a wide variety of reasons, but a key foundation stone is the different groupings of the pulse. If I was teaching you how to march then I would probably stand in front of you and shout “1-2-3-4” at a suitable speed for you to walk in time to. My natural instinct would be to then start at “1” again rather than going on to “5-6-7-8…”. This is because it “feels” like the right thing to do – it feels natural. Something in me makes me want to group my counting into 4 beat groupings. However, if I was teaching you how to waltz (an unlikely scenario given my ability (or rather lack of ability) on the dance floor!!) then I would want to count “1-2-3” and then return to “1” because this is what fits with the dance steps. This natural instinct translates into music as well. In music, these groupings of beats are called bars. The first beat of every bar is accented (played slightly louder) to give the characteristic feel of that particular grouping. Can you hear how this gives a marching feel to the piece? Do you notice the change in feel? This is because the “ch’s” are now grouped in threes giving a totally different groove to the piece. It now feels more like a waltz. In order to show this information to someone who is reading music we need to have a Time Signature. What do Time Signatures show? The top number is easy to understand. If it is a “2” then you should count the pulse in groups of 2 and each bar should add up to 2. If it is a “3” then the pulse will be counted in groups of 3 and each bar will add up to 3. If it is a “4”, etc…… You get the idea. The thing you must do when looking at a piece of music for the first time is check to see whether the time signature changes at all. Sometimes a composer will put a new time signature in during a piece of music. It’s really important that you have a look through before playing a piece because a change of time signature which catches you unaware can totally wreck your performance. If you’re playing as part of a group or a band then it can spell real trouble! !